Over the last month or so I have read a handful of books that were each so very good I knew I wanted to tell you about them. 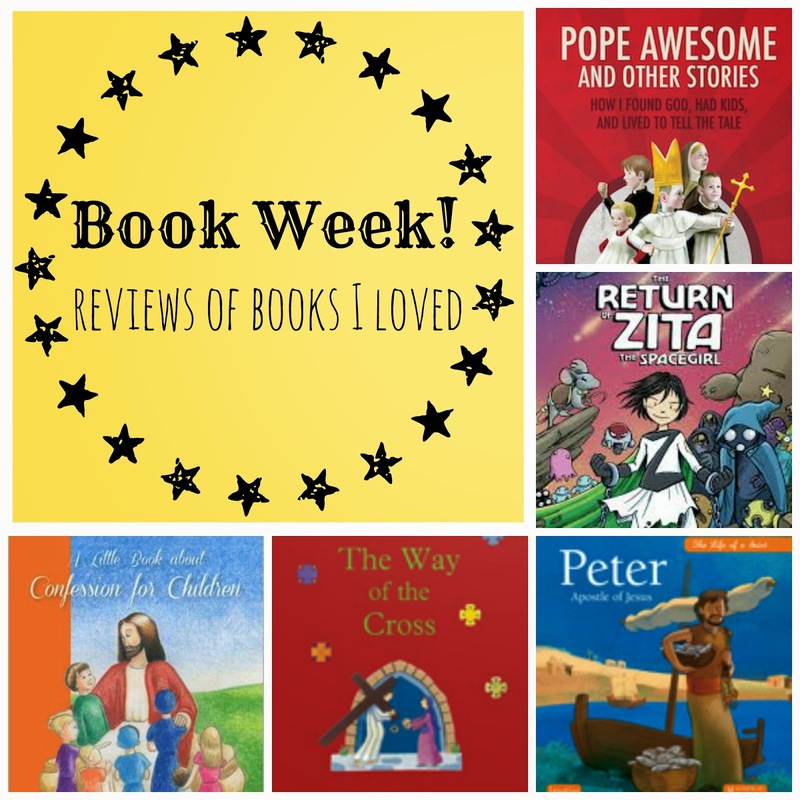 I decided to set aside a week to do a review each day and, thanks to the generous folks at Ignatius Press and Magnificat, I also have a free copy of Kendra Tierney's A Little Book about Confession for Children to give away at the end of the week. If you have read any of the books I'm reviewing I'd love to hear your thoughts, too! Leave a comment or link to your own post in the combox. As far as I'm concerned every Catholic home should have a copy of this book. 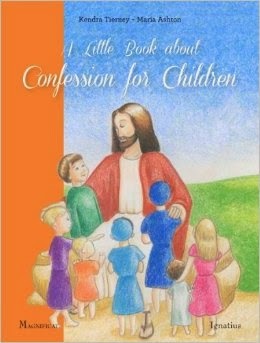 A Little Book about Confession for Children is ordered in a logical way, with all of its sections building upon the previous content: a glossary in the beginning, a QandA section next, a review of the Ten Commandments, saints who can help us prepare for and make a good confession, and an excellent examination of conscience. The book ends with a word-by-word write up of the dialogue in the confessional with directions for what to do and say and what the priest will do and say. Throughout the book are warm, sweet illustrations, my favorite being of the priest listening to a boy's confession. Kendra wrote A Little Book about Confession for Children because she couldn't find a good resource to prepare her son for his first confession. Pamphlets and books did exist but none of them were really age appropriate. The reason, I believe, that this book is so perfect is because she wrote it not only as a catechist and educator but as a mom. Because she is writing as an educator everything is clear, intelligent, and applicable. Because she is writing as a catechist everything is orthodox and written to illuminate the beauty of the Catholic faith and the Sacrament of Reconcilliation. Because she is writing as a mom everything is written in a warm tone and in a voice that does not speak down to the child asking the questions and preparing for the Sacrament (or even the parents!) but with much respect and encouragement. Some of my favorite details about A Little Book about Confession for Children are the flaps on the book's cover that serve as easy-to-use guides to making a confession, praying an Act of Contrition, and doing an examination of conscience, and the excellent examination of conscience that reviews each of the Ten Commandments and gives age appropriate questions to make sure they're keeping the commandment. For example, "You Shall Not Kill" is followed by, "Did I try to make other people happy? Did I try to help them when they needed it?" and so on. I know Kendra wrote this book for second graders but I think it is a powerful and useful tool for kids throughout grade school and on. I could see this book being helpful to converts, reverts, and even to non believers who just want to understand what Catholics believe about confession. Heck, I even got something out of the book and I'm a 32 year old woman who's been actively practicing the Catholic faith my whole life! Do yourself a favor, enter to win a free, autographed copy of A Little Book about Confession for Children. And if you don't win, go ahead and buy one. You won't be sorry you did. "Cry the Beloved Country" by Alan Paton has been a favorite of mine for many years. The first few pages are especially beautiful. "Pete the Cat and his Four Groovy Buttons" by James Dean and Eric Litwin. My son loves this Book. He loves to make popping sounds when the buttons pop off. It is also a good reminder to me not to get attached to "stuff"
I'm presently trying to finish Kimberly Hahn's 'Chosen and Cherished' before Lent is over. It's been full of some great reminders as well as new outlooks on marriage and family life. Currently reading "Introduction to the Devout Life," but I'm a little hung up on the requirement for a general confession. Is that different than a regular ole confession? A "general confession" is when you confess all the sins you can remember from your whole life, even those that you've already been absolved from. Its often done before receiving a one-time Sacrament, like marriage or ordination. I have been doing it every few years when on a retreat. I find it helpful to revisit things from my past as I get older and have a better understanding of my faith. If it doesn't sound like something you'd want to do, that's fine. It's not required. But if you're interested in doing it, it's best to make an appointment with a priest ahead of time and let him know you're interested in doing a general confession. Thanks for the response. Every sin you can remember? That would require an appointment because we might be there all day! I'm just starting to re-read "My Sisters the Saints" by Colleen Carroll Campbell. I really enjoyed it the first time through and I know there is more gems there to catch a second time! What is that "Return of Zita the Spacegirl"? I love it just because of the cover. Can't wait to see that review! Just started reading "The Incorruptibles" by Joan Carroll Cruz. I love that you can easily read bits at a time! I just finished "The professor and the madman" - fascinating story of the origins of the Oxford dictionary. Also, "The Sinner's Guide to NFP" by Simcha Fisher which was thought provoking.. And I have read "Pope Awesome" and really liked it. How she tells her conversion tale helps me see the Catholic faith a little better (and I'm a cradle Catholic!). Thanks Bonnie! And in case your readers are wondering, the book has been approved for an imprimatur from my bishop, Archbishop Gomez, but it didn't arrive in time for the first printing. I have heard so many good things about Kendra's book, that I'm thinking about buying a copy now and my oldest kids are four! We're a fee years away from confession for them but it would be nice to have it on hand. I just heard about "When Did I Get Like This? : The Screamer, the Worrier, the Dinosaur-Chick​en-Nugget-Buyer​, and Other Mothers I Swore I'd Never Be" and am interested in reading it. Sounds like it'd be a funny "Mom" book. I would love to win that book! It looks awesome! I'm in the middle of "10 ways to destroy your child's imagination" by Anthony Esolen. Awesome!! I just read The Tale of Three Trees with my kids. Quick read, very meaningful and easy for little ones to understand. There are a lot of great books listed, I need to read more! I love seeing what people are reading. And yet, I hate to admit what I'm reading. What does THAT say about me? Nonetheless, I just finished "Soy Sauce for Beginners" and am about to start "The War of Art." Happy sigh. I love having a book waiting for me. I like Hind's Feet on High Places by Hannah Hurnard. Thanks for the giveaway! The last book I read was The Mass by Cardinal Donald Wuerl and Mike Aquilina as prep for a high school retreat and it was a good yet easy read. My kids love any children's book illustrated by Maite Roche. My 3-year-old points at the picture of baby Jesus in The First Noel and says, "Jesus is drinking his mama Mary's milk!" I would love to win that book to give it to my youngest son for Easter. I recommend Girl at the End of the World by Elizabeth Esther.